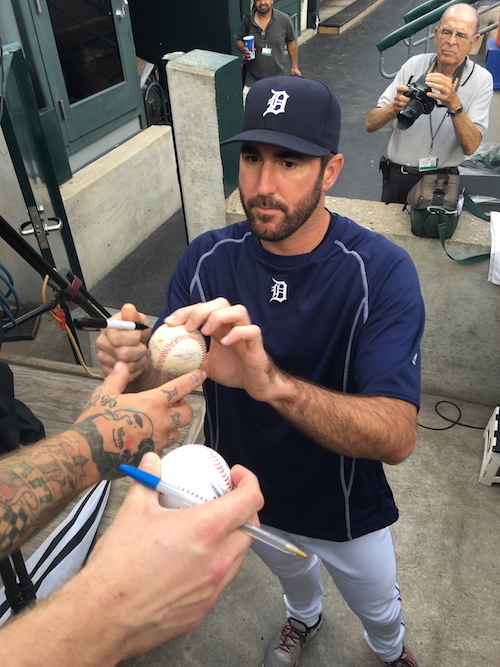 Here is an original photo of Tigers star pitcher Justin Verlander signing autographs prior to a recent game at Comerica Park in Detroit. The picture was provided by Lance Martinez of My Detroit Sports. When it comes to Detroit Tigers autograph signings, Verlander has long been at the top of the list. Verlander’s stellar career includes 2006 AL Rookie of the Year honors, six All-Star appearances, as well as winning both the AL Cy Young Award and MVP in 2011. To date, the Virginia native has amassed 171 total wins, amid leading MLB in that category twice. He has also led baseball in strikeouts a whopping three times. Prior to the 2013 season, the Tigers rewarded Verlander’s achievements when signing him to a seven-year/$180 million deal. That financial package came on the heels of the five-year/$80 million contract Verlander signed a few years prior. Earlier this year, Verlander and longtime girlfriend Kate Upton got engaged. The pitcher has been dating the supermodel for several years. Verlander remains one of the most well known players in baseball and a very popular figure amongst Tiger fans. This season, the 33-year-old is 14-7, with a 3.28 ERA and 1.01 WHIP. Here are a few other iFolloSports.com original stories involving the team and Verlander over the past few years.